I sat in tears at a friend’s home. Finally confessing to the state of my apartment. I said ‘Have you seen that TV show ‘Hoarders’ well that’s me!’ I don’t think they really believed me. On the outside I was always so well-groomed and professionally dressed, but inside I was an emotional mess. My friends offered to come around and help me ‘ tidy up’. But they had no idea as to the extent of the problem. I was so ashamed. Too ashamed to let them see how bad things were. My lovely two-bedroom apartment had become a one-bedroom disaster zone, where I needed to navigate every step just to get into bed. I felt so overwhelmed I seriously just wanted to hire some men with a skip and throw EVERYTHING out of the house. And I mean everything: everything heaped in cupboards; everything stuffed and spilling out of drawers; everything askew in kitchen cupboards and benchtops; everything littering the floor – clothes, clothes and more clothes, bags of craft supplies, mounds of books, broken electricals, old computers; everything hanging over chairs and door frames; every mountain of “stuff”; even the furniture. Getting rid of every thing. Just leaving me with walls and carpet and empty space. Luckily a friend was a bit more level headed and investigated some other options for me. 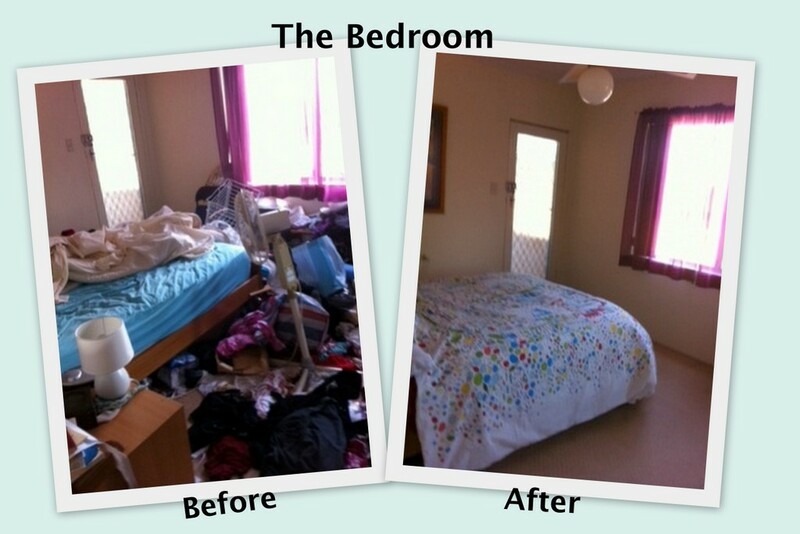 I took one week off work and with the help of a professional company, we decluttered – room by room, bit by bit. I donated or recycled 30 packing boxes of all sorts of things and gave away bags of clothing, a couch, a sofa bed, an outdated computer and an old TV. Everything that remained was given a dedicated place. Clothing hanging in order in the built in cupboards – summer in one closet, winter in another, necessary daily items packed in see- through boxes or allocated drawers, rarely used or specialty items vacuum packed and neatly labelled, even necklaces hanging on a rack in the closet with matching earrings and bracelets neatly beside, ready to go. What a sense of freedom! I could then start fresh and create a home to be proud of – some minor renovations : new internal doors; new light fittings; new bathroom vanity; new lounges; new rug; and ‘voila’ a place to feel good about coming home to. I had my first visitors dropping in for a cup of tea or a simple dinner or drinks with nibbles. Opening my home for the first time in over 2 years. What a celebration. I hope the before and after photos below will encourage you. If I can do it, feeling broken and overwhelmed, the ultimate hoarder, you can too. Have courage. Nothing is impossible!! From Colleen: I would like to thank our fellow 365er for sharing her story of hope and success in this post for us today. For obvious reasons she would prefer to remain anonymous but her contribution could possibly be a great help to someone out there in the same position she was in. So if you feel that your clutter has gotten our of control please follow this example of how you can find your way out with one simple step of getting professional help be that physical help like our reader or psychological help if you are having trouble letting go. Declutter papers and the necessities for storing them ~ If you can be realistic about what papers you really need to keep or are even still relevant not only can you get rid of a lot of aspirational and sentimental clutter you can also reduce the space and containers in which they were stored. 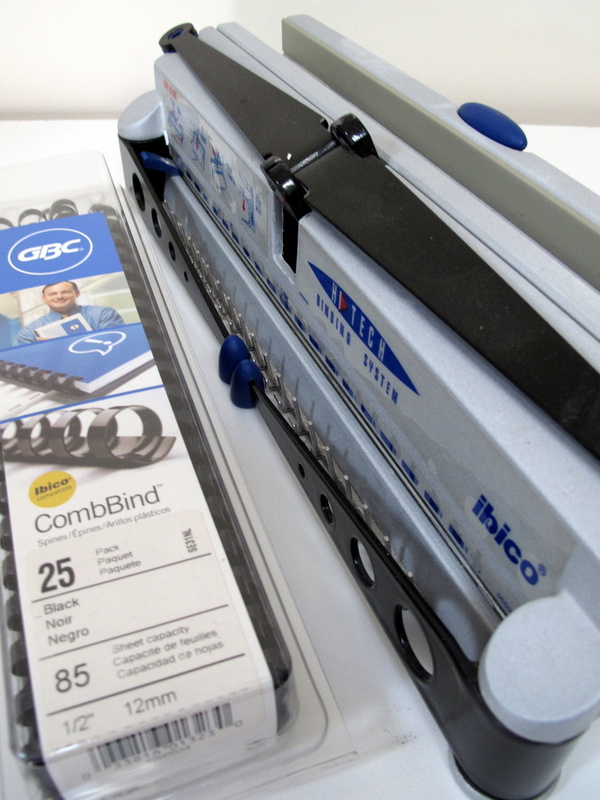 I bought this binding machine for $6 in a thrift store in America years ago. I thought at the time that it would be so useful for both crafting and for my children’s school projects. I have used it many times over the year but not enough to justify the space it was taking up in my craft room. I was comforted in the fact that both my son and I were of the opinion that if we wanted something bound we could just get it done at our local office supply store. Feeling like I had a productive day yesterday and not suffering physically in the evening for the effort. 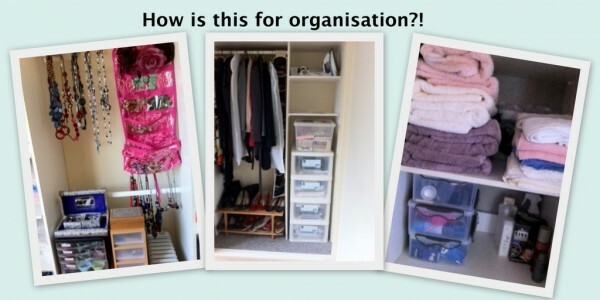 « How Do You Know You Need to Declutter? This space looks great! So pretty and looks so easy to move around in. Now you will be able to enjoy your living space and having company over. Looks awesome and is inspiring for the rest of us. Wonderful job! I particularly like the living room and your accessories. Enjoy your space! congratulations!! your apartment looks absolutely fabulous….all it takes is the ambition to begin….great job!!!! Thank you for sharing your story. I am struggling with my own decluttering process. My husband and I just had a garage sale this past weekend. Whatever we didn’t sell was loaded into a truck and immediately driven to Goodwill. It took his truck and my car just to get those items to Goodwill. However, those things were only the items that had accumulated in a single shed. We still have another sheld plus the rest of the house to declutter. By the end of the garage sale day I was so disgusted with myself and all of the stuff that I had that I was nearly in tears. I hope to continue this decluttering process and I find this blog and the stories told by others to be a helpful push in getting me where I need to be. Thanks again Anonymous, you are definitely not alone. never be disgusted in yourself. You are on a path heading in the right direction and that is all that matters. Enjoy the progress for what it is and don’t dwell too much on how it got that way. Learn from your mistakes and just let them go and be proud that you are working your way to a better life with less. Every single item you declutter is one.less.item. I like that advice Jane. Someone said that to me the other day but I can’t remember who. Hang in there, Valerie! Don’t focus so much on what is ahead — celebrate that you have made a great start! Really, getting started is the hardest part (well, that and giving up on the dream of a fairy godmother waving her wand and making it all go away). I think it so great that you had the sale and did NOT let the leftovers back in the house — that is HUGE! Good luck as you progress. Valerie, when you are going in the right direction, just keep walking. To quote Mary Engelbreit, “Don’t look back. You’re not going in that direction”. Sounds to me if you and dear husband are going in right direction. good on you Valerie, we all seem to accumilate stuff over the years. me too. But like you I am on this journey too and we all support each other on this journey of ours. Yes I agree with Valerie the help and encouragement from all you 365er’s is great and we can see that we are not the only ones struggling. Inspiring! Thank you for sharing! You are so courageous! I never thought of it as that (hoarding)- but I do know now. I am still in the process – unfortunately, a man who offered to temporarily store some of it, while I tended to other boxes to make room – he decided he no longer wants to help (and he’s bringing it all back today! Ah!!!) – and I refuse to rent an off-site storage unit. I know myself too well – I would never go there to sort it out – out of sight, out of mind, you know? 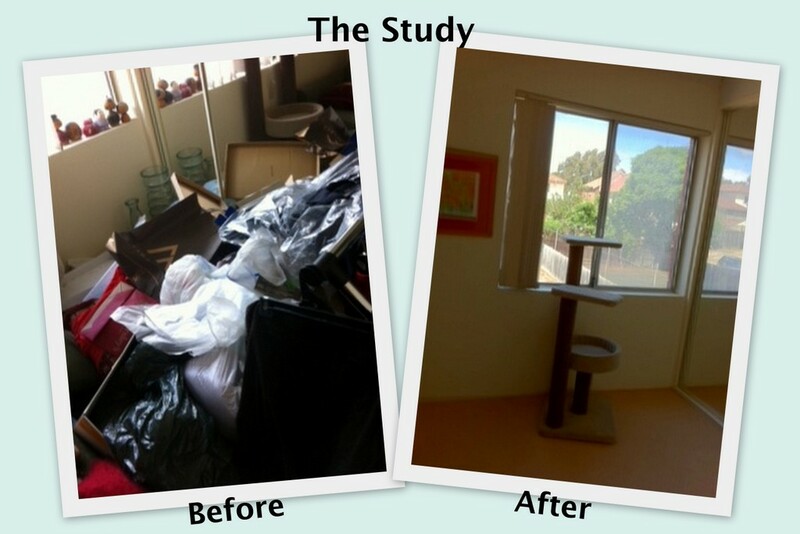 One HUGE progress I am very proud of – and all you fellow clutterers and hoarders can do this – STOP buying stuff! I have not gone shopping (emotional, compulsive) for the past 5 months now! I do not know what made me stop after all these years – maybe it was time for me to take the blinders off? I am not too far away from that myself. Good work Ingrid, stopping shopping is HARD but a sure fire way to not let your progress slip back to where you were before (and fought so hard to change!) Just keep it up, and slowly things should settle into a new, uncluttered normal! Ingrid, good on you for stopping shopping. It’s all very well to declutter, but impossible to control stuff if MORE stuff is coming into the house! Good luck with your decluttering journey!! Ms Anonymous – WOW!!!! Thank you for being brave and telling us your story, I am so glad you took the first step and spoke to your friend because your home is now fabulous, the stuff that is in magazines! Holy frijoles! What a vivid & most excellent transformation! 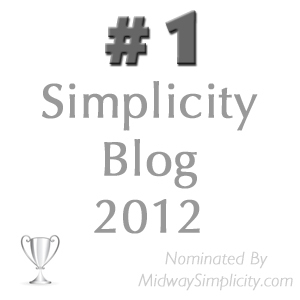 Good job to Anonymous – I’m so very proud of you! Bravo indeed! I really don’t want to seem rude or to undermine this lady’s situation and her efforts, but these pictures look like nothing to me. My grandmother is a true hoarder. The rooms I see in these pictures look extremely disorganised, but this is maybe 2% of what Grandma had in her small townhouse. The City of Rodando Beach threatened to condemn the property, and it took a crew of two dozen people alternating shifts an entire week to clean it out. An aunt and a brother worked to find undamaged heirlooms, but the vast majority of the stuff was unsalvagable for donation, and went straight to the dump. That was in 07′, it is already half way there again. I am so thankful my mom doesn’t own a place, it would be bad too! No wonder I am a declutterer! Seriously, to the authur, great job on your apartment. You were very overwelmed, but you are not a hoarder. Hi Jean, as you say your grandmothers house is half way there again perhaps that is the direction Anonymous was heading it had she not seen the error of her ways when she did. Thank God she had seen those hoarder shows and decided that could be me and turned her life around. Thanks so much anonymous for sharing – that took courage but honestly, it is very inspiring and uplifting to see how you turned the situation round. Your home looks beautiful now. Absolutely amazing. A round of applause to the person who submitted this article for their courage and persistence. Everything in life really does begin with the first step. HI Anonymous! We are proud of you. You have really made great progress. It’s wonderful. Colleen, someone wanted to buy me one of those binder things for a present and I told them I didn’t really need it. I have a friend who has one if I were to ever need one and like you said I can go to an office supply store and have it done. It’s one less thing to have in the way. I have a couple of other things I think I am going to get rid of that I don’t use much. I have a 5 inch wide Xyron tape machine. I think I have used it 2-3 times in the 3 years I have had it (another present). Thank you for sharing! I think a before and after shots site could be the next big thing, everyone likes to see radical and drastic improvements like this. You have something to be proud of, and with all our help, I’m sure you can keep it looking like ‘after’! Hi Snosie good idea I might make a before and after page for the blog where my readers can go for inspiration without having to search for the post that include before and after pics. Amazing change, congratulations! I’m glad you told your friend and got help. Things that seem overwhelming can be doable with an “outsider” there for support. That’s so inspiring. Your home looks beautiful and welcoming now! What an amazing transformation! Good job on achieving such an uncluttered and lovely space. I’m also glad you had a friend who was able to help you find a level-headed way to cope with your sense of overwhelming clutter. Hurray for you, Ms. A! Way to go! WOWSA! Thank you for sharing, for your bravery and most importantly, for coming clean to your friend(s) and asking for help and taking action to get help and move forward! I ADORE YOUR HOME!!! Love the living area, so peaceful! Bravo to you Ms A!!! BRAVO!!! Wow! Thanks so much for sharing! That is very impressive and encouraging!! Maybe you could do another guest post writing about that week with the professionals? What they did/how they did it and how you felt about it? That would be really interesting! Hi Ideealistin – I second that, I would be very interested to hear about working with professionals. BTW – how do we describe ourselves? Enthuisiasts? I like that. “Decluttering enthusiast”. I think we are everything, aren’t we? (Former) packrats, (aspiring) minimalists, tidy, messy, organized, overwhelmed, full of inner peace, wise, foolish, succesfull, stumbling, procrastinating … I actually like the diversity here, like how the accomplished help the aspiring. Maybe one could say we all are: dedicated. I think we all try to turn our homes AND our minds into a better direction. Thank you very much for this brave post! Your home looks very welcoming now. Very airy. I really like that blanket on the after shot of your bedroom. Thanks everyone for your encouraging comments. I just wanted to write that post for the one person who thinks they’ll never get there. When 10 minutes a day just isn’t achievable because of the incredible feeling of being completed overwhelmed. You can do it! Ask for help if you need it. Honesty is really the first step. I’d be happy to write a few words on the process. It really was quite an emotional journey that week. Lots of confronting things – not just “stuff” but memories too! I have ADD, and everything pretty much looks the same to me, as if it is all in the background. What I’m saying is that things that are out of place don’t stand out in my vision the way they do for most people. That is the most helpful thing about taking photos for me – for some reason when I look at a photo I can “see” the stuff that needs to be removed easier. So I did that for several hours on Sunday, picking up the 1 or 2 most noticeable items in each of the 20 or so photos I took. But it’s Wednesday now and I haven’t done anything since. I make lovely plans and I make good starts, but it’s incredibly difficult for me to stick with and follow through. I’ve participated for years on a couple of other organizing forums, so I doubt that anyone can offer any advice I haven’t heard before – so I don’t really know why I’m writing this. I guess it’s just the old thing of try, try, again. Hope, I’m sorry to hear that things are not going well for you. I hope you are getting some medical help for the depression. Medicine can do wonders for it and will make things seem a lot less gloomy. I will be praying that God will help you with all of this. I wish I lived closer because I would be glad to come over and help you with this. Blessings. Hi hope, I agree with what Deb J had to say. Medication for depression can sure help see things in a more positive light. I have suffered from depression in my life so I know how debilitating it can be. When I suffered I was lucky that I had the time and money to get counselling and medication. It did me a would of good. Like Deb J also said I would be there in a heart beat to try to help you at no charge if you lived nearby. I would be interested to know what sort of barbaric company does not allow you to take time off. I can imagine that it would be hard to take care of your home when you never get enough time off to take care of all those other things that you mentioned need doing. At some point you still find enough time to rest, which is very important to staying healthy. I think you biggest problem is that you just work too hard to begin with. 1. Pick up after yourself as you go along. This should stop new clutter from accumulating. 2. Only work on the accumulated clutter when you have picked up after your daily meanderings within the home. Instead of decluttering a thing a day set aside a half a hour a day to declutter. Right after dinner would be a good time then you still have lots of time after to relax. Anything you put aside to declutter either goes straight into the garbage, the recycling or into the trunk of your car to go to the donation location of your choice. At the end of each week drop off your donations. Pick somewhere convenient for this. 3.Don’t look at the task as one big scary job that needs taking care of. All you have to do is that one half hour a day. No matter how little or how much gets done does not matter. Just commit yourself to a half hour. As a result since you only have time to grocery shop and do other chores on the weekend and you are keeping up with the daily decluttering and doing a half hour each day your clutter should be gradually reducing. If it isn’t then you are obviously bringing more into your home than just groceries. I would love for you to stay in touch and ask for as much advice as you need. I will send you my email address so you can contact me if you need. Love your commitment to getting decluttered, anonymous. I know this was quite a feat. My husband would have a fit if I hired a professional to come help me. He always claims that “anyone can do this – you are just lazy”. What I am is tired and worn out from the heat in the summer. (That’s not to say that I couldn’t declutter in the winter. :)) But thanks to this website, I am tossing something everyday and even though it is not visible to everyone, I know the drawers are getting cleaned out and so are the closets. On the subject of not buying anything, just wanted to say that I have been subscribing to quilting websites that send me emails when there is a sale. It is very enticing but recently, I have just been deleting the emails and not looking at them. I DO NOT NEED any more fabric. Today, I decided to unsubscribe to them. If I want something, I know how to find them online. No temptation, no purchases. Ingrid, thanks for the nudge. Maggie, I’m offended for you that your husband is calling you lazy. People hire others to work on their cars, cut their grass, trim their trees, wash their dogs, clean their houses, make their coffee (coffee shop purchase), paint their walls, trap/kill their pests, and cook their food (eating out). Are all those people lazy? How are any of those different that hiring a decluttering professional? On a more upbeat note, GREAT JOB for unsubscribing to the quilting store. You’re right, you know where to find them, and you don’t need temptation constantly dangled at your door. Those emails/sales are nothing but digital and mental clutter! My husband’s mother was a housekeeper by trade for a number of years so did not work outside the home. 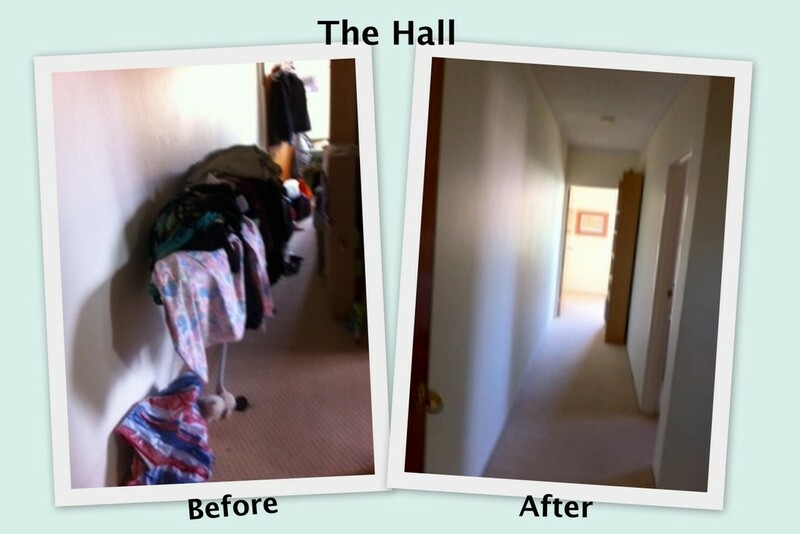 She “always” kept a spotless home even after she stopped working at that job. Let me tell you that when we bought her house and I started cleaning the corners, behind the curtains and other unseen places, there was lots of cleaning to do. But she did not allow any clutter – no hobbies, one child, did not read, had no extra-curricular activities. So my husband thinks I should keep house like she did. I work full-time (still at age 66), we are still living in the old house (she sold it to us when she said she was too old to care for it anymore – she was 50! ), and it still does not have central air. We raised two wonderful children with all their friends and activities and entertained and had pets. Don’t know how hubby can think I have the same life as his mom. I think now that she died last year, he is remembering a lot. What he has forgotten – on purpose or not – is that he used to tell me that he felt like he lived in a museum because he was not allowed to play in the living room because it was messy and he didn’t want us to live like that. So, I just nod and say, okay, and just move on. I can do what I can do and if he should want to jump in and help, I’d be okay with that. Don’t want to sound like a martyr but it is easier to agree and do my own thing. Thank goodness, even I am getting tired of all the stuff and am cleaning out. By the way, in response to your note about the under the bed. There is nothing under our beds now but my cutting mat. The kids tossed or took their things out long ago. Fantastic job and SUCH an inspiration! 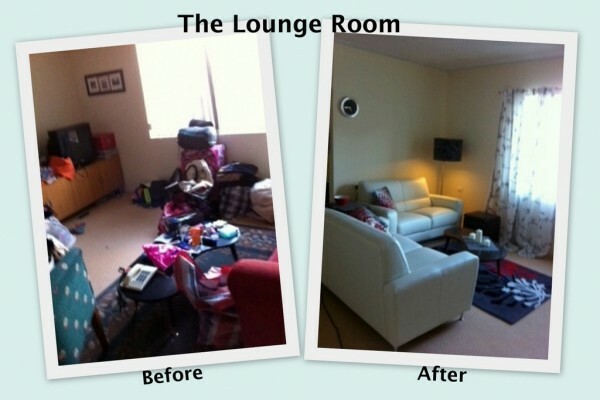 My home is nowhere near your “before” pictures and yet I feel ashamed at inviting people over, so I completely get it. I know the desire to have people just drop in…and I will get there one day! My cousin lives in that kind of messy enviroment. We used to be flatmates and in the end I couldn’t stand her clutter anymore (i’m a compulsive organizer). I hope someday she would find the way just like this girl did! I can imagine it would be a difficult situation to live with someone who is the exact opposite to yourself when it comes to tidiness. I have been fairly fortunate in this although my children leave a lot to be desired but they have always been pretty good outside of their own bedroom. Within reason I allow them to do what they like in their own space.